Mike Hawes, chief executive of the SMMT motor manufacturers body, said removing the grant for plug-in hybrids was "totally at odds" with ambitions to cut CO2 and "sends yet more confusing signals to car buyers". Manufacturers, which are having to adjust to tumbling sales of diesel cars, have invested heavily in electric technologies, he said. "Prematurely removing up-front purchase grants can have a devastating impact on demand – without world-class incentives, government’s world-class ambitions will not be delivered," Mr Hawes said. The RAC’s head of roads policy Nicholas Lyes said the move was "a major blow to anyone hoping to go green with their next vehicle choice". "With up-front costs still a huge barrier for those hoping to switch to an electric vehicle, this move from the government is a big step backwards and is in stark contrast to countries like Norway where generous tax incentives have meant that it has one of the highest ownership levels of ultra-low emission vehicles of anywhere in the world." And Jack Cousens, head of roads policy for the AA, said: "The government wants to end the sale of petrol and diesel cars, but scrapping grants for low emission cars may well stall their progress. "This announcement will simply put more drivers off from buying greener cars." It is a pity that the AA and RAC don’t support ALL DRIVERS, instead of the handful who get taxpayer funded rebates and avoidance of fuel taxes. It is significant though that the government appears to have thrown hybrids under a bus. Whilst they may be more economical in terms of petrol usage, hybrids still need fossil fuels, and therefore cannot ultimately help the government to achieve its decarbonisation targets. Hybrids also seem to offer little in the way of helping development of all-electric cars. As such, they could be an impediment in the full roll-out of the latter eventually. An unnecessary distraction as it were. Without big bribes of public money, most motorists won’t bother with inadequate and over-priced electric cars subject to monster depreciation. Quite right. Unless poor people can subsidise rich people’s virtual signalling car choice, rich people begin to lose interest in paying over the odds. As we know, those green virtues only run skin deep for many of the grandstanders and not as far as their wallets for the majority. 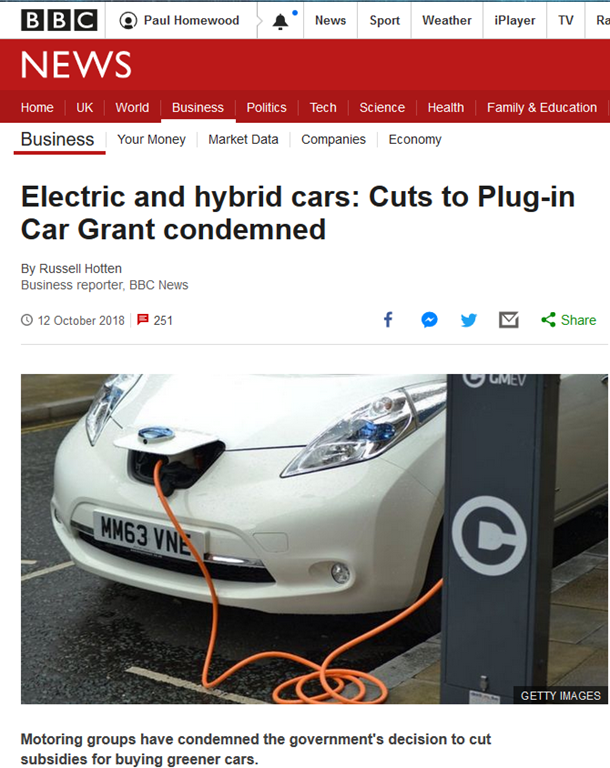 I am surprised that the BBC haven’t said that the Government are “banning” hybrids! If I want to virtue-signal that I support humane treatment for stray animals, all I have to do is click Like and Share whenever I see those pictures on FB. If I want to virtue-signal that I am better than all you greedy polluters who are killing the planet, there’s a cost. First I have to drive the impractical inconvenient POS and second you have to pay me to buy it. If there were any justice I should automatically be placed on the Honours List and you should have to call me Sir Michael. Generally, whenever the government interferes and gives an incentive, the companies providing the goods merely put up the price by the amount of the incentive and say thanks very much for all the free cash. That is what housing developers quickly learned. Motoring organisations may condemn the Government decision to cut subsidies, but taxpayers welcome the Government decision to cut subsidies. Let the motoring organisations pay the subsidies if they are so keen on them. How could you suggest that some people should get a payout paid for by everybody else? The motoring organisations are just waffling the usual response to yet any government selective bribe being reduced. Think what would happen if governments were to reduce all payouts for selected (and often self-selected) groups. Oh, the wailing and gnashing of teeth and the sudden rush on supplies of sackcloth and ashes. The industry has a long way to go before it can compete with the reliable petrol and diesel vehicles. In the circumstances, manufacturers are sure to be considering pulling out of the hybrid industry now that sales worldwide are way off reaching target figures and hitherto silly subsidies are rightly being pulled. And for the government the loss of fuel duty and Vat. I’ve been wondering how they tax motoring electricity and not electricity used for domestic purposes. Still think that if the Government thinks these EV’s are so wonderful, they should immediately change all Government vehicles to EV’s, then they will see that these stupid vehicles are not the answer. It would also help if all MP’s and Government official are made to change their personal vehicles to EV’s, to set an example. Bet they’d soon change their minds about EV’s. Great idea, especially if applied to the bin lorries of the People’s Green Republic of Brighton. I do so love the BBC. How in s that headline remotely honest and unbiased? Yes, the cuts are condemned by those who think the cuts are bad. Pretty sure that’s how it works. But the cuts are also applauded by those who think they are right. … especially when the BBC reporting generates more complaints, which then get reported as more complaints, etc. If EVs are as good as they cracked up to be by the BBC et al, they would sell at full retail !! Charging the battery is also a big issue, e.g.time required, frequency of need and opportunity. Throw in battery life and degradation as well. A comment by a Peugeot representative on the change to electrification: “I will be able to market cars with 400kW (536bhp).” This is ridiculous but is supported by HMRC in tax benefits. A car from a well-known prestige manufacturer costing an extra £10K as a hybrid and providing 455bhp, over the “ordinary” model’s 340bhp, could attract company car benefits that would cover the extra cost of the hybrid in two years. Even worse, real world fuel economy (as tested) would still be poor. Government grants and support for electric-only may be justified, but only for small, “affordable” models such as the Nissan Leaf. No it is never justified. Gov’t are trying to mandate new technology before it properly exists. Encouraging new tech is one thing, this stupidity is another entirely. The root cause is yet again, our insane CC Act, and the loons who insist on delivering it. I notice advert for ultrafast charging here – 400 miles in 30 minutes. Jam packed gas station on the motorway which when dispensing gasoline is distributing energy equivalent to a small power station. It won’t work, can’ they see that? Sadly, the AA and RAC are just businesses these days and no longer represent the ordinary driver. Truckers have the FTA and RHA to support them – and who must be consulted on traffic schemes by law – there are groups for taxis, buses, coaches, even two for us motorcyclists. Councils are being encouraged to promote EVs and ULEVs by closing off streets to any vehicles bar ULEVs on top of Saddo’s coming restrictions for the whole of London. There has been a challenge to a Hackney scheme that has a hearing this week. There are a lot of worried virtue-signallers in councils waiting on this outcome. Please keep us informed of the result. If it goes the way one expects these days it will be applied to metropolitan areas across the country. I smilingly remember the recent sad tale, reported here, of the authoress lass. Her trials and tribulations getting some distance in her totally electric car to give a talk and receive accolades on HER book were truly entertaining. They were also highly predictable. Not only that, but the various hurdles she faced in her virtuous little putt-putt had been discussed on this very site. It also brought up another hurdle. Apps on your electronic device do not always mirror reality. She found out the hard way, that downloading it to her phone did not mean the places listed were actually operational. Meanwhile, the driver and each passenger sitting in the car is emitting roughly 1500 grams of CO2 each day. Currently there are no regulations on CO2-emittance directly from humans, but expect the EU to introduce such regulations in the near future.